"They Teach That" podcast is hosted by Kevin Patterson, to offer insight, advice, and thoughtful discussion to scholastic broadcast programs across the country. 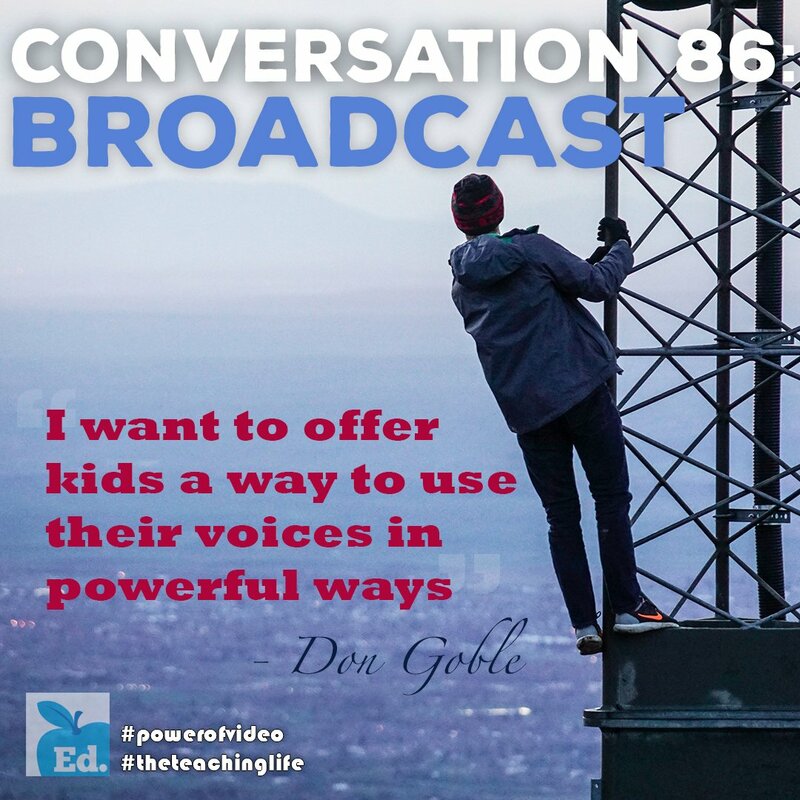 In this episode, Kevin chats with Don about his approach to a problem many broadcast advisers may have, Don's belief in the importance of media literacy, and how we can engage students by enabling their creation of content. Click here to listen to the podcast. 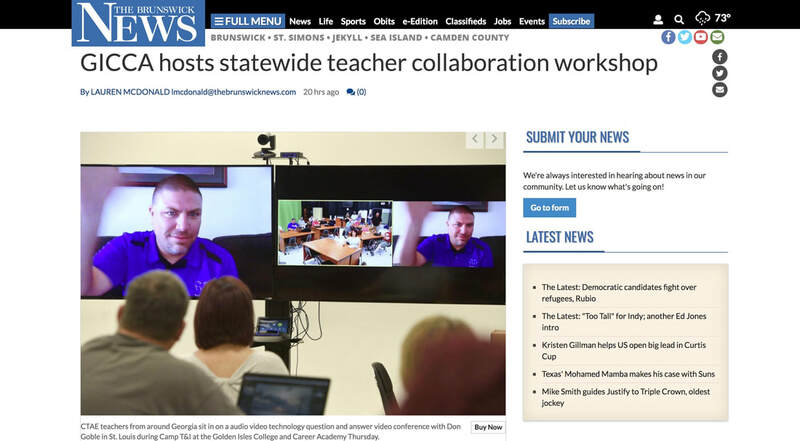 "Sitting in the desks normally occupied by students, a group of high school teachers turned their attention to the double screen at the front of the classroom earlier this week. Don Goble, a multimedia instructor, greeted them from St. Louis, Mo., where he sat on the other end of the video conference call." What happens in classrooms is only a fraction of a child’s learning. 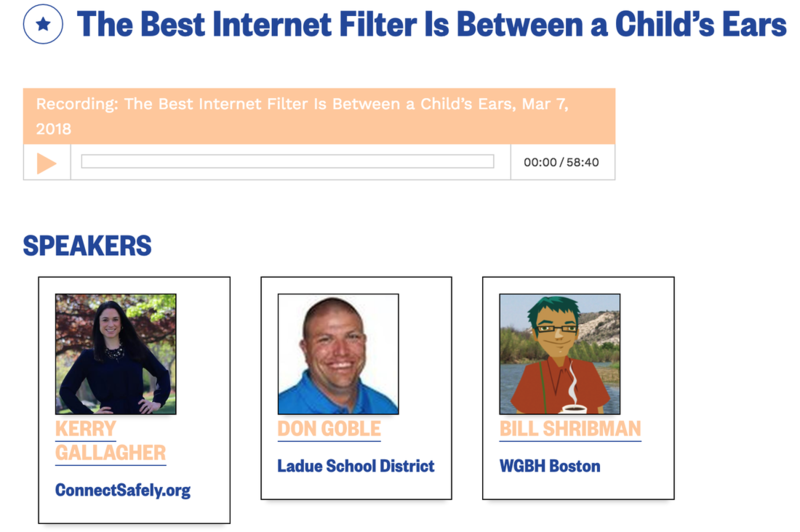 Educators, professional media producers, and internet safety advocates all play a role in how children learn to be consumers, creators, and critical thinkers when on the internet. We will consider how they search and play, and what they see, make, and share online. Children’s identities encompass both digital and “real” worlds. Let’s look at all the ways children learn about the digital world and how we can help. Click HERE or on the image to hear the audio panel. Connect with Kerry on Twitter @KerryHawk02 and see Bill's work with PBS and Ruff Ruffman. Don was a guest panelist on HEC-TV "Live" discussing media literacy. Don took part in three separate programs targeting elementary, middle, and high school students around the country. The archive for each program is available on Educate.Today website. "Sneak On The Lot" blog posts try to give readers a little bit of everything. They like to showcase various students who have made an impact with their freshly learned filmmaking skills. They like to inform people of various websites they can use in their classrooms or even just a simple technique students can do to make their films better. This month Sneak On The Lot wanted to start a new chapter and showcase a teacher who has had exceptional success in his classroom and ask him to tell us all how he did it. Meet Don Goble, broadcasting and filmmaking instructor at Ladue Horton Watkins High School, St. Louis, Missouri. Click on the image to the left or the READ MORE image to read the full article. Students from around the world are connecting via videos – and, it’s all thanks to a website a couple of St. Louis Ladue students created, the Global Student News Network (GSNN.weebly.com). Don Goble's acceptance speech in Denver, CO as the Journalism Education Association's National Broadcast Adviser of the Year for 2015. Promotional commercial for PBS (short version). Promotional commercial for PBS (long version). SchoolTube.com is profiled in this episode of Behind the Minds. As a part of that feature, HEC-TV came to Ladue to film my program and how/why we use SchoolTube in our class. KSDK News Channel 5 in St. Louis featured my students on the "Show-Me St. Louis" program in 2009. PBS NEWS HOUR: Should teachers be using social media in the classroom?